Winter has knocked the doors, with shorter days and longer nights. Last week it was cold, gloomy, dark and raining. Even though it was thanks giving weekend my husband was working from home. After eating rice for two days continuously we were desperately craving from something spicy and hot. What else could be more comforting than “Chole Batura” which also happens to be one of our favorites. Generally chole is served along with batura/ bathure , is a mouthwatering dish originated from Punjab. 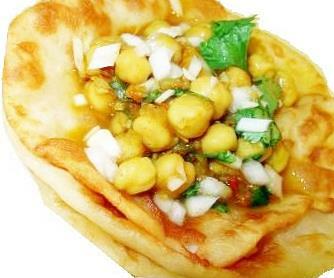 Chole batura is also a popular street food snack in Northern part of India. Traditionally leveling agents like soda, yogurt and yeast are used in preparing batura dough and fermented for hours (4-6 hrs) and deep fried, which sometimes consumes lots of oil while frying. I was searching for an oil free batura recipe, I googled and found one on Tarla dalal’s website. I have been making it since then. Chole is also known as Channa Masala. 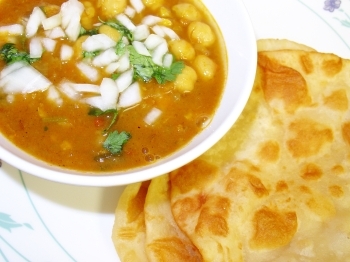 Puri/Poori and Chole/Channa masala is another popular combination. Heat oil in a heavy and deep skillet on medium flame. Add cinnamon stick, cumin seeds and allow it to splutter. Now add chopped onions, ginger-garlic paste, green chillies and sauté till the onions turn soft and golden brown. Add turmeric, chilli powder and channa masala powder sauté for couple of more minutes. Now add chopped tomatoes and tomato puree and sauté till the oil starts to separates and tomatoes becomes soft and mushy. Drain the excess water from the cooked beans add it to the skillet with salt and 1 cup water and mix well. Turn the heat to low and cover the lid. Let the mixture cook slowly on low heat for 20 minutes so that masala can blend well. Keep stirring in the middle. Add the chopped coriander leaves, stir well and turn off the heat. Reserve few coriander leaves and chopped onion for garnish. Sieve flour and salt into a bowl, add grated potato, oil and knead into firm dough without using any water. Knead the dough very well till it is smooth and pliable. Cover with a wet muslin cloth and rest the dough for 10 minutes. Divide the dough into equal parts and roll out into circles. Mean while heat oil in a deep pan or skillet, fry batura’s one at a time till the baturas puff up and both sides are golden brown. Drain excess oil on paper towel and keep warm while you fry the remaining. This got to be fav for many. Love it everytime. Thanx for the treat. I will see you in 2 weeks, meanwhile I will try your chole too at home. Love chickpeas! I cant wait to try the chole. And those baturas look delectable! Vegeyum, this is my shortcut version of chole. Kay, I do use canned one’s when I’m really lazy / instantly. Yes Jaden, its all purpose flour. Opps!! Thanks for remanding me. I will update it now. My husbands favorite combo, some how im scared of deep frying things, like poori, murrkku any deep frying for long time!! For us this is a real treat.. having deep fried food. But now my taste buds are crying out for some yummy chole Bhature. Let me go and soak the chanas NOW. Your picture looks very delicious. My kids’ altime favourite!..I too make chole almost the same way.Onion rings are preferred in my home! Adding potaoes to bhaturae is new to me..Wont it absorb more oil when frying? Kalva, you use spatula( one with the holes) to slide the poori’s or carefully slide it from the edge and use a deep vessel to fry. Hope you will try soon. Jeena, it really easy and yummy dish give it a try. It’s my lazy & short cut version, so I just used few reserved onions for garnish :D.My husband loves onion rings slightly seasoned with chilli powder, salt n lemon juice along with some hot green chillies 😀 They don’t consume oil Bharathi. Infact they come out super soft. Give it a try. How did I miss this, was I sleeping or what ? You have made me hungry now. Love chole and bhature. what a delish looking plate.adding potatoes are new to me too.. do u still the slightly fermented taste of batura with it? Thanks and good see u back swapna. Shaheen if you want that fermented taste in batura’s add 2 tbsp of sour yogurt and instead of large potato use medium to mix and let the mix sit 30-45 mins. Could you also share the OIL-FREE-RECIPE? Could you also share the OIL-FREE-BATURA recipe? Hey tanx a ton for the recipe….i tried n it came out really well…. Thanks:) it’s really awesome dish and my husband loves it..
Am trying this chole batura today lets see how it woks with potatoes for the baturas. Rest is fine. Hi, I typed up the ingredients in the order they appear in the recipe, since that is the conventional format…maybe it can help someone else.